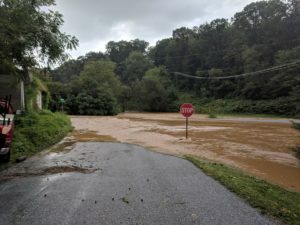 From the enactment of the Pennsylvania Floodplain Management Act (Act 166 of 1978), floodplain monitoring has traditionally been the responsibility of the Department of Community & Economic Development (or its predecessor, Department of Community Affairs, DCA). 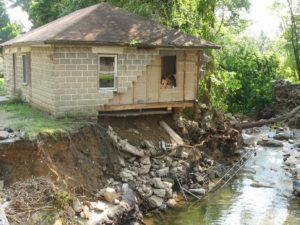 Act 166 requires that a municipality enact and enforce an ordinance to meet the requirements of the Pennsylvania Floodplain Management Act and the National Flood Insurance Program (NFIP). DCA was able to manage this program until 1994, when the Department was reorganized into the Department of Community & Economic Development. The staff that handled floodplain management was then reduced 75%, which made it impossible for DCED to provide guidance and technical support to municipalities as they had previously. For that reason, in 1997 DCED entered into an agreement with the PA Association of Conservation Districts (PACD) to provide the services that DCA had previously provided to municipalities. To date, approximately 30 conservation districts have participated, at different points in time. Meet with municipal officials and review the enforcement of their ordinance. This is referred to as either a community assistance contact (CAC) or a community assistance visit (CAV). Conduct a visual survey of the municipality to see whether there has been any development in the floodplain since the last visit. Provide training on how to read and use floodplain maps. Establish a library of educational materials about floodplain management for municipal staff and citizens in their municipalities to use. The District does not have enforcement responsibilities in this program. 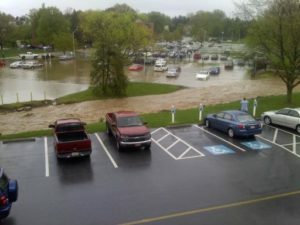 For more information about York County’s Floodplain Management Program, contact Gary R. Peacock, Watershed Specialist, at 717-840-7687 or e-mail gpeacock@yorkccd.org.